You can maintain your heart and blood vessel function naturally. HDL is considered the "good" cholesterol, the body's arterial janitor, helping maintain healthy blood vessels. Even a 1% increase in HDL can make a significant difference. Enzymatic Therapy Hdl Booster is an exclusive, doctor-developed formula. 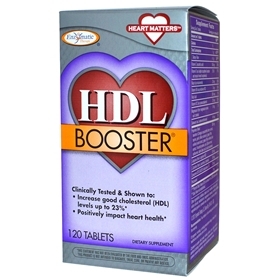 HDL Booster was developed & recommended by Dennis Goodman, M.D., former Chief of Cardiology at Scripps Memorial Hospital, to help his patients increase their good (HDL) cholesterol levels naturally. But it does more than boost HDL levels, it also provides powerful antioxidants, and helps restore the CoQ10 depleted by commonly-prescribed cholesterol medications. There are several lifestyle changes that may be of benefit for increasing the "good" cholesterol, HDL. This is very important, since every point of increase in HDL can significantly decrease the risk of heart disease. In an ideal situation, the liver produces cholesterol, which is carried by LDL or "bad" cholesterol, throughout the body, serving vital functions. The HDL then shuttles the cholesterol back to the liver so that too much doesn't build up in the bloodstream. Problems arise when there is too much LDL, and not enough HDL to carry it back, creating an imbalance that may lead to heart disease. Exercise is tried and true way of increasing HDL cholesterol works over time. Taking fish oil supplements has been shown to increase HDL cholesterol, as well as other omega-3 fatty acids such as ground flaxseed, chia seeds, green leafy vegetables, and walnuts. Consuming several fish meals per week has been observed to significantly increase HDL cholesterol. Other dietary factors include decrease refined sugars and carbohydrates, avoid smoking and alchohol. Directions: Two tablets in the morning and two tablets in the evening. Notes: If pregnant, nursing, or taking prescription drugs, consult your healthcare practioner prior to use.